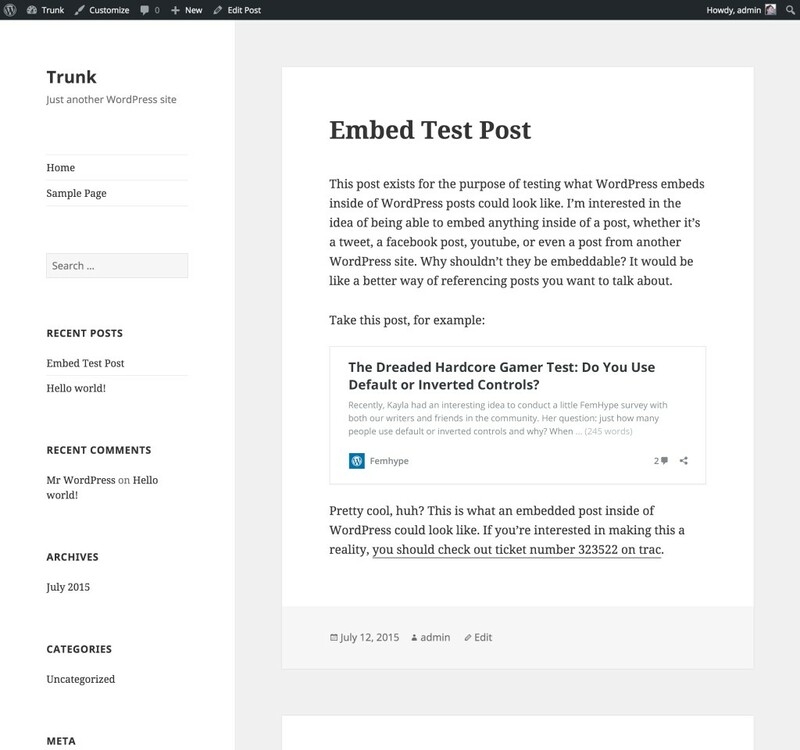 On Monday during the feature plugin chat we proposed a new plugin to explore making WordPress itself an oEmbed provider. That means that instead of just embedding YouTube videos or tweets you would be able to paste the URL of a blog post and a short preview gets embedded right away. We will be holding weekly chats in the #feature-oembed Slack channel on Mondays, 21:00 UTC. If you want to get involved with this feature plugin, you should definitely join us. oEmbed requires lots of trust. Security is very important, while still maintaining ease of use. I suggest you to read the initial discussion on #32522 to see where we’re at. I won’t be able to make the 7/20 chat, but want to share that I’m pretty excited about this concept. We’re implementing something similar for a client right now and I use a similar idea on a personal site. In both cases, it’s a custom display of custom post type data (e.g. including post meta) that is being displayed. It would be sad if the core implementation did not allow for custom post types or customized templates. Note that this implementation isn’t a true oEmbed provider (you can’t whitelist my site and start embedding book reviews yet). But it’s a similar editorial experience to true oEmbed and at 10up we have at least one client project in development to make content on the site true oEmbed endpoints for easier sharing and cross-linking on their network and on installs they manage outside the central multisite network. I have been implementing this for clients with shortcodes (ex. [embed post_id="7"]) that are generated through a search functionality on the tinymce editor, although I think a URL is better for most users. Also, I wonder how often people will want to be oEmbed-ing their own posts? Maybe allow for some extra filters so that if it’s on their own site they can grab that meta content and apply their own styles?